January's blog is written by Lynne Read of The Auld Post Office B&B near Thurso in the north Highlands to celebrate kilt spotting on your Scottish vacation. Here's our guide to almost guarantee the splendour of a sighting of a Scotsman in his kilt. These take place on 25th January, or as near to that date as can be arranged, in most villages, towns and cities across Scotland, as well as many private celebrations at home. While Burns' poems are recited in Scots dialect, the evening unfolds with music, storytelling and blessings to the haggis, before it is carved by the chef and devoured with mashed neeps and tatties. It's the time to share a dram with a fellow countryman and say a wee toast to the lassies, as we celebrate the birth of Rabbie Burns, humanitarian and the most celebrated of Scottish poets. 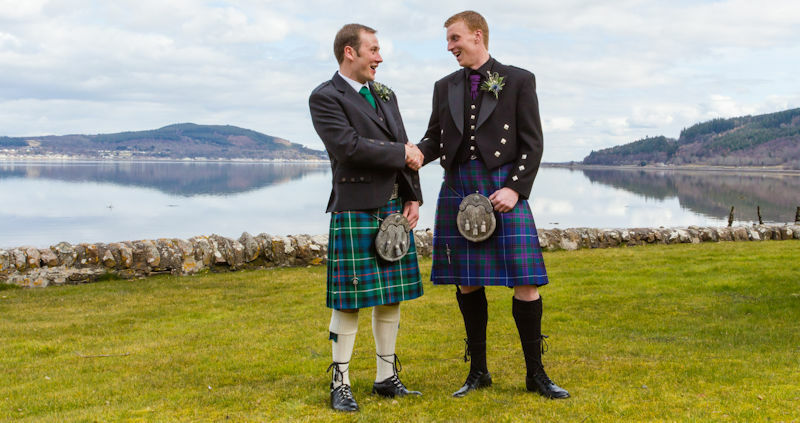 On this particularly Scottish of evenings, there's no doubt, men in kilts are a welcome sight! 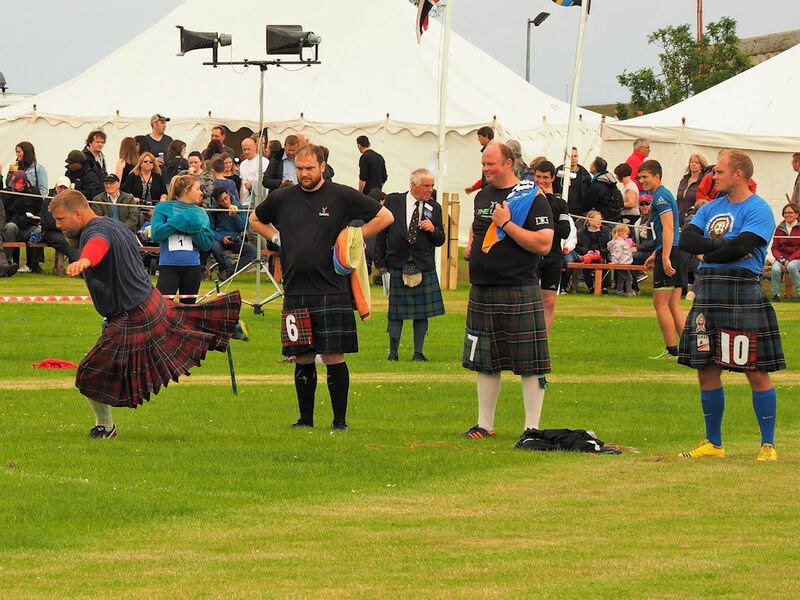 If you time your visit to take in a Highland Games or Gathering, they're generally held on a Saturday or Sunday, from May through to September, and take place at locations the length and breadth of the country. For centuries, the kilted 'HEAVIES' toss the caber, throw hammers and put the stone. More recent events include carrying a heavy stone over distance and throwing a heavy stone over a bar for height. Be sure to get your tickets early for huge events such as The Braemar Gathering held at The Princess Royal and Duke of Fife Memorial Ground with Massed bands visiting this year from Canada. The Solo Piper competition for the over 18s takes place throughout the day, and if someone younger reaches a high standard, they may apply to the Convenor to take part. On such occasions, the most stoic of Scottish men's eyes are likely to glisten. 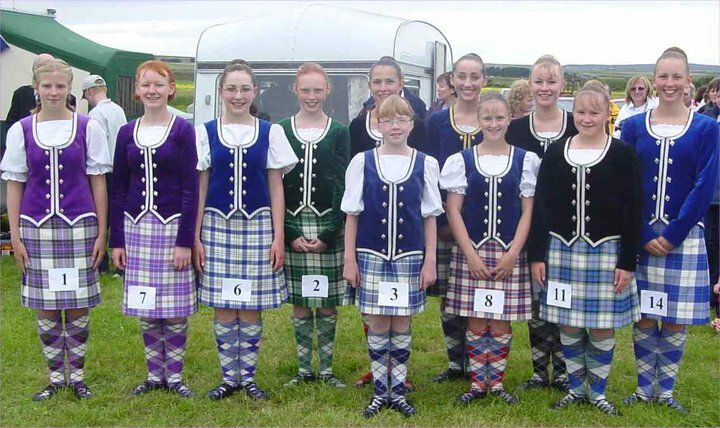 Let's not leave out the lassies - you're sure to have a sight of the young ladies dancing a reel in their Scottish dance costumes of velvet and tartan plaid. Or the Ghillie Callum (Scottish Sword Dance) the oldest of dances is said to date back to the 11th Century. The original Ghillie Callum was a Celtic prince who defeated Malcolm Canmore's chiefs (Shakespeare's Macbeth) at the battle of Dunsinane. As he crossed his own bloody sword over the bloodier sword of the defeated chief, he danced over them both in exultation. The tradition continued among Highland warriors as a measure of prowess, as the dance requires tremendous dexterity, skill and stamina not to displace the swords. To check for dates of Highland Games, visit our 2018 events pages. 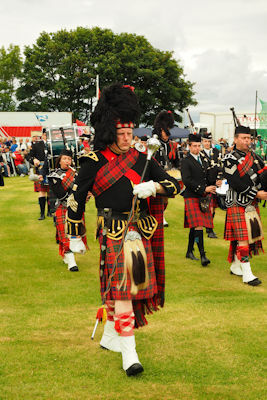 The Royal Scottish Pipe Band Association (RSPBA) is responsible for the annual Major Championships. In 2018 the British, European, Scottish and World Championships will be held at locations in Scotland (Paisley, Forres, Dumbarton and Glasgow respectively). The RSPBA encourages a bond of fellowship with all Pipe Band personnel across the world. Many towns all over Scotland have their own Pipe Band. The Pipe Major leads the march of his pipers and drummers, and bands can often be seen marching and playing their instruments at their home town centres throughout the summer months. 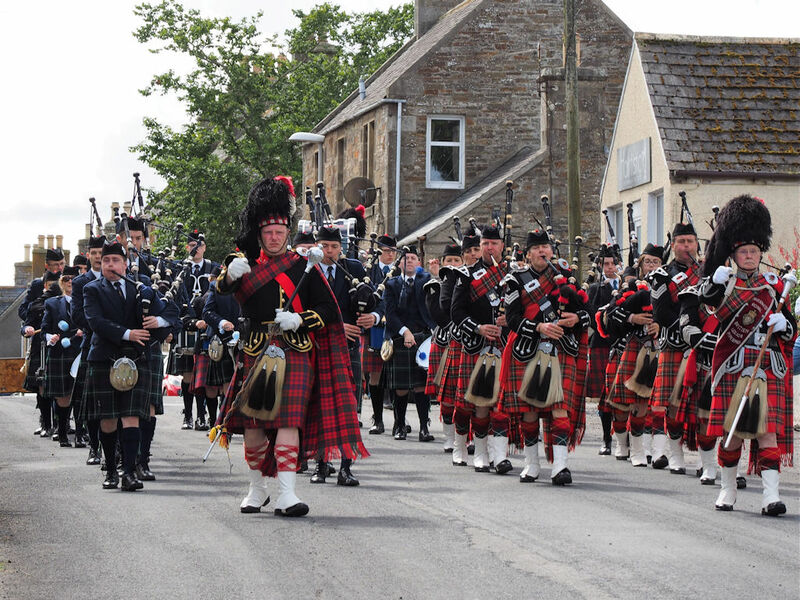 Individual Pipe Bands have a programme of events and could be playing locally, on an evening or weekend, while you're staying with a member of Scotland's Best B&B's. Keep a look-out on our Events pages for what's on in 2018, there's something special for everyone throughout the summer season. 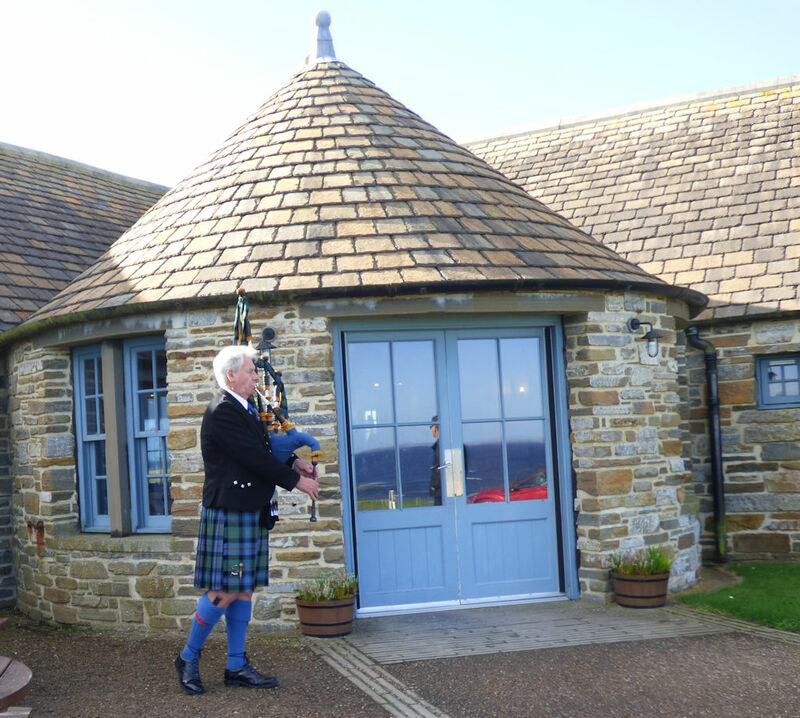 Very often at these events, a lone Kilted Piper will be playing at the entrance to welcome you. If you're lucky enough to be visiting Scotland to attend a wedding, there's no finer venue for the sight of Scotsmen in their kilts. They'll be dancing in the evening too, with the promise of the swirl of the kilt! Take a moment and glimpse the smiles on the faces of the ladies watching! Weddings in Scotland often take place on a Friday or Saturday, if you see a bridal car parked outside a church, rest awhile and await the bridal party as they emerge in their finery. 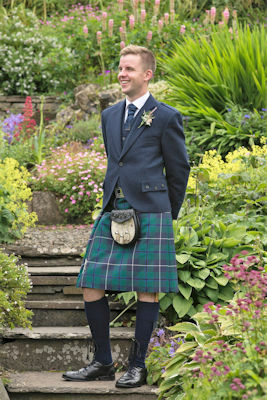 The groom and his friends and male members of both families are most likely to be dressed in the tartan of their clan. A sight to behold indeed. Wishing you every success for your sighting of a Scotsman in his kilt! See more about The Auld Post Office B&B near Thurso in the north Highlands.